For the College’s Open Access Publishing group I put together a semi-regular digest of news and recent developments around to Open Access and related topics. As this might be of interest to others too, we have decided to make this available via the blog too. For more information on OA, take a look at the Open Access website of the College Library. HEFCE have released their Open Access policy. We will discuss this in more detail later, but this policy is likely to be a game changer as far as Open Access in the UK is concerned. The Research Information Network have released a report on Monitoring Progress in the Transition to Open Access, including proposals for a framework of indicators to monitor progress towards open access. Jisc have, informally, confirmed that their OA Monitor project is likely to address at least part of this if institutions find this useful. From April 2014 onwards, the National Institute for Health Research will expect peer-reviewed articles to be made available as Gold OA, expecting full compliance within four years. Wellcome and NIH are withholding grant payments when OA obligations are not met (Imperial scholars have not been affected by this). The Open Access Scholarly Publishers Association has suspended Springer’s membership because of systematic problems with the editorial process at Springer revealed by the so-called “Open Access sting”. Jisc, RLUK, RCUK, Wellcome Trust and others published a report that examines the potential risks associated with the APC open access market (APC = Article Processing Charge for OA articles). The economic analyses undertaken provided a strong indication that the full open access journal market is functioning well in creating pressure for journals to moderate the price of APCs. On the other hand, the current hybrid market was found to be extremely dysfunctional, with significantly higher charges and low levels of uptake. Indeed, the average APC in a hybrid journal was found to be almost twice that for a born-digital full open access journal ($2,727 compared to $1,418). The authors suggest different approaches, including only paying APCs to hybrid journals that offer reductions for subscriptions payments or setting caps to APCs in relation to the quality and range of services offered by the journal. The Wellcome Trust released the full data on the APC spend 2012-13. A community effort led to that data being cleaned up (Google doc spreadsheet) and analysed within a few days. The analysis revealed that the average APC paid by Wellcome is £1,820. 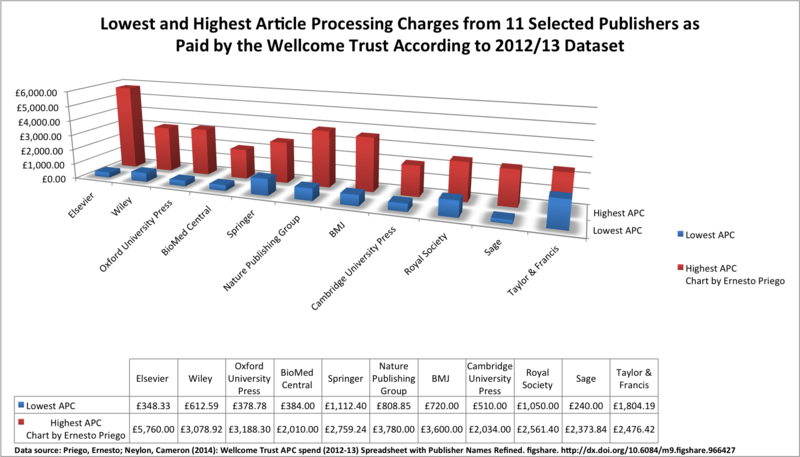 In Oct 2012 – Sept 2013, academics spent £3.88 million to publish articles in journals with immediate online access – of which £3.17 million (82 % of costs, 74 % of papers) was paying for publications that Universities would then be charged again for. For perspective, this is a figure slightly larger than the Wellcome Trust paid in 2012/2013 on their Society & Ethics portfolio. 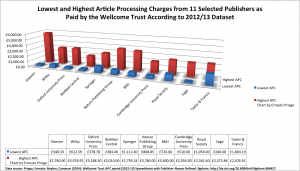 Only £0.70 million of the charity’s £3.88m didn’t have any form of double charging (ie, was published in a “Pure Open Access” journal) – with this total being dominated by articles published in PLOS and BioMed Central journals (68 % of total ‘pure’ hybrid journal costs, 80 % of paper total). Michelle Brook has shown that Wiley-Blackwell wrongly claim that CC BY licenses do not allow others to re-use the article commercially. Peter Murray-Rust has identified several cases where Elsevier has put OA content behind paywalls, charged for the full text or mislabelled the license. This has been picked up by Times Higher and Elsevier have admitted that they mischarged 50 people for use of OA content; they are refunding money. CC-BY licensed articles still linked to sites such as the Copyright Clearance Centre, where readers may be charged for re-using open content. In summary we contacted 20 publishers in relation to 150 articles (approximately 7% of the total number of articles for which an APC had been paid). We expect every publisher who levies on open access fee to provide a first class service to our researchers and their institutions. […] Even though there are only a small number of articles that the Wellcome Trust has paid to be open access that have remained behind a pay-wall, this is not an acceptable situation in any instance. The bigger issue concerns the high cost of hybrid open access publishing, which we have found to be nearly twice that of born-digital fully open access journals. We need to find ways of balancing this by working with others to encourage the development of a transparent, competitive and reasonably priced APC market.